eD@HoMe: Lovely covers from United States! Today, I would like to share with you 2 covers from the United States. The first cover was from Washington States. Thanks Mary! The 2 stamps of a Hawksbill turtle (Yes!) 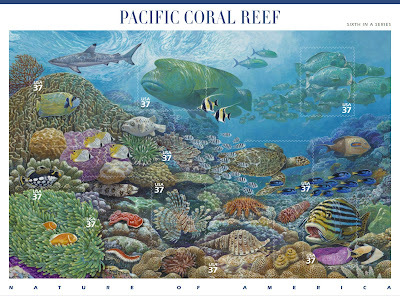 & Bumphead Parrotfishes belong to the Pacific Coral Reef Series, issued in 2004. A lovely souvenir sheet is shown below. 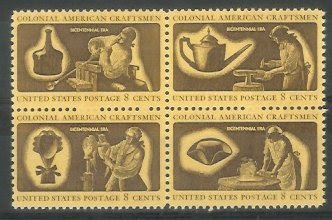 The yellow stamps on the lower right of the cover are part of the Colonial American Craftsmen Series, issued in 1972. 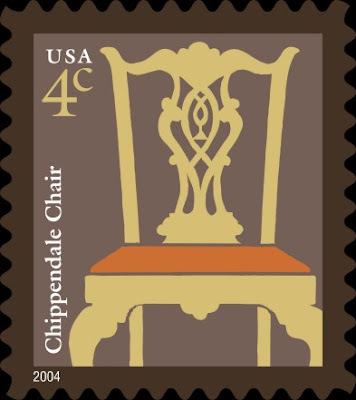 Next on the cover is a stamp featuring a Chippendale chair. It was issued in 2004 as part of a definitives series titled 'American Design' which started in May 2002. The Chippendale style of furniture was named for the English cabinetmaker Thomas Chippendale (1718-1779), whose book "The Gentleman and Cabinet-Maker's Director" (1754) influenced furniture design on both sides of the Atlantic. His works were known for their carved decorations and elaborate chair backs. In America, the style varied by region, with Philadelphia artisans producing the most extensively ornamented furniture. The 2nd cover of the day was sent from Pennsylvania. It had traveled 15,390km and took 6 days to reach me! 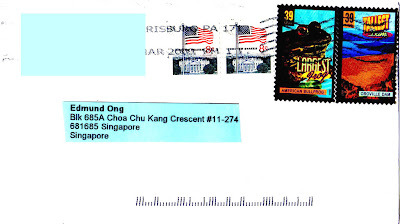 The 2 se-tenant patriotic stamps showing an America Flag over white house were issued in 1968. 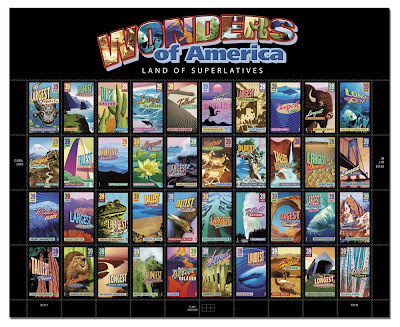 On the right of the cover, we have 2 stamps from The Wonders of America: Land of Superlatives commemorative series in 2006. It is a 40 stamps set. "From coast to coast, our nation is blessed with scenic beauty and wondrous sights," said Postmaster General John E. Potter. "Today the Postal Service is celebrating 40 of America's extraordinary natural and man-made marvels. These stamps provide us with an opportunity to pay homage to those places and things that make this country so spectacular." I have to agree with him as I was totally fascinated by this great country during my tour 3 1/2 years ago. I will end today's posting by sharing with you some pics taken during this awesome trip.